Juicing is cold off the press! 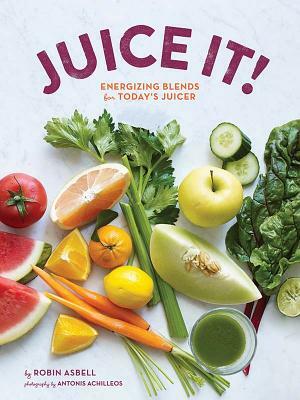 Filled with 65 vibrant recipes for turning fresh fruits and vegetables into delicious and healthful juices, this refreshing cookbook offers essential guidance for utilizing the increasing number of juicers and high-performance blenders popping up in home kitchens. From perky blends such as Mango Green Tea Booster and Ginger Jolt to quiet soothers like Berry Melon and Grape Night's Sleep, these inspired beverages guarantee invigorating flavor combinations and prove the power of drinking your vitamins and loving it too. Whether the goal is weight loss, cleansing, increased nutrition, or more energy, Juice It! makes it easy to whip up blends that taste great. Robin Asbell is a chef, food writer, and cooking teacher specializing in natural foods. She lives in Minnesota.